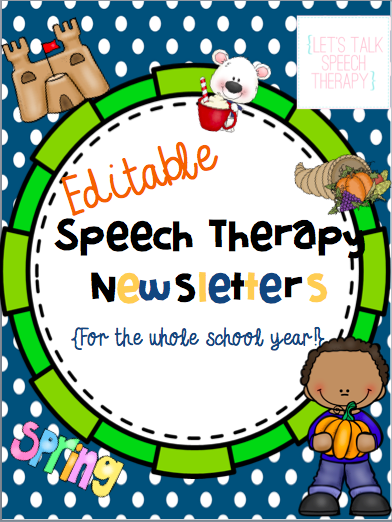 Speech therapy resources, materials, ideas and tips. After all, if there's one thing we do it's talk! From that day on, I’ve worked to make sure ALL of my students know their personal safety information. Now, in order to line-up to go back to class, I use personal safety questions as “exit tickets” for each student. My caseload consists of about 50% moderate cognitive disability students along with a lot of other diagnosis, so I have to go a little bit beyond “Hey kid, learn your phone number”. In undergraduate, I did some in-home therapy with children on the Autism spectrum and I learned the technique of backwards chaining. I dusted off this old skill and I’ve been seeing great results with my entire caseload. Here’s what my setup looks like. Break up the phone number according to the student’s number identification level. If they can identify 2-digit numbers, break it down like the photo below. If they can identify single digits only, you’ll need a few more pieces of paper. This method is easy enough to teach, so I’ve taught it to my special education teachers and their assistants, which has been great for reinforcement! What ways have you found to be successful in teaching personal safety information? I’d love to hear about them! I remember this time last year–getting ready to ring in 2015 and while I was excited, I wasn’t sure how great of a year it would be. For the first time, there were no graduations, licenses or other monumental occasions that I knew were coming. Little did I know, it would turn out to be a year of accomplishments! If you follow me in Instagram, you saw these photos this year–my top 9 photos of 2015! A lot of giveaways, funny e-cards and a cat costume. So you know, typical. -In November, I got the incredible chance to head to ASHA in Denver (my first solo flight!) and spent the weekend with these 14 incredible fellow bloggers. These ladies are hilarious, smart, wise, and all around good souls. 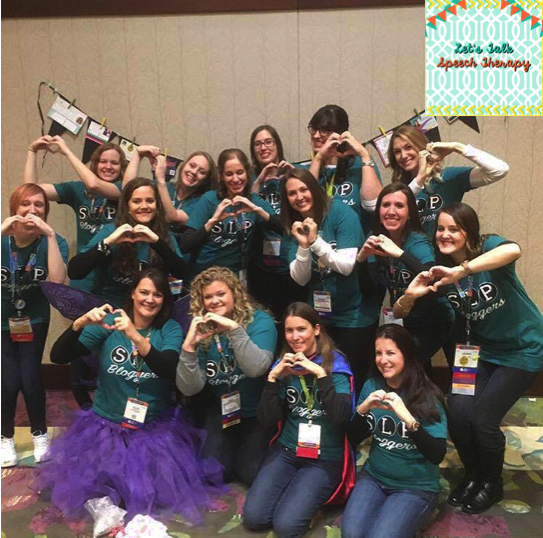 I also got to meet so many of YOU readers at our SLP Blogger Booth, which was the icing on the cake! –Put away the data binder more. Yep, you read that right. While data drives everything we do, I want to be more present with my students and hear what they have to say, not just how they say it. My goal is to spend one session a month unbound by my massive pink binder and be all the more intentional with my kiddos. –Get a handle on paperwork. Especially in the spring, you can find me any given morning writing last minute paperwork (whoops!) for my school caseload of 80 and counting. I’m resolving to have paperwork I need done at least 3 days in advance to save my sanity, and ensure my students have the best documentation and IEPs possible. –Eliminate the clutter. 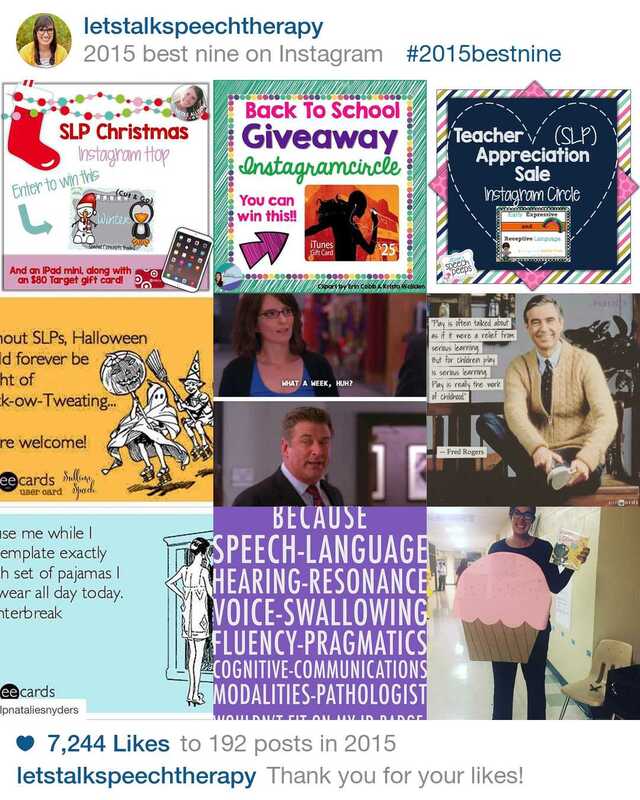 This is my third school year as an SLP, but I’ve already collected a hefty stash of speech materials. There may or may not be an entire room in my house I refer to as “the toy room” because it’s entire contents are full of materials and toys. I stocked up on any and everything I could get my hands on during grad school and some things I haven’t touched since. It’s time for quality over quantity (and gaining another room back in my house!). 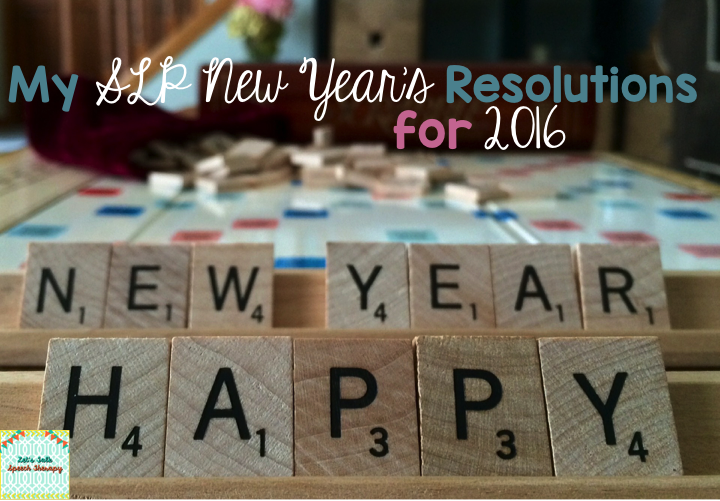 What are your resolutions for 2016? I’d love to hear them in the comments. Happy New Year! 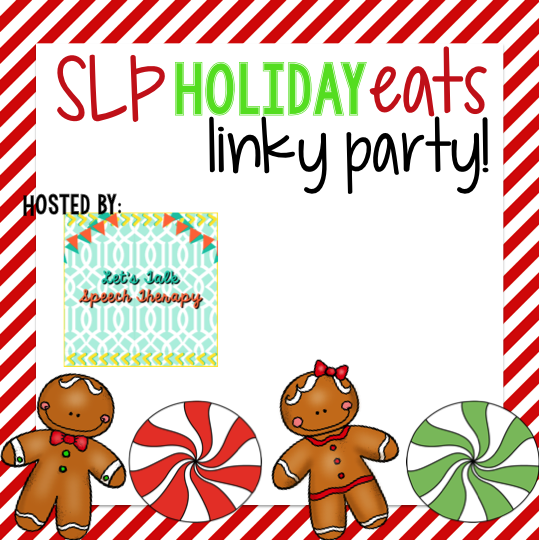 SLP Holiday Eats Linky Party! Their responses were not only helpful, but delicious! So, in true friend form, we’re passing along our go-to recipes that we love during the holidays. My treat was first given to me by a former client’s family as a Christmas gift…and I instantly asked for the recipe! They’re simple, quick, NO-BAKE and are always the first thing gone at staff carry-ins! Melt chocolate chips in a pan over medium heat, then add peanut butter. Once melted & combined, add the rest of the ingredients. Transfer to a greased or lined 9×13 baking dish and let cool. Be sure to check out the rest of my blogging pals below for their treat suggestion! Happy eating! It’s here! Cyber Monday is just around the corner, and not only am I attempting to stock up on gifts, I’m also stocking up my speech room! Nothing eases the winter blues like a whole slew of new materials and activities in speech, for both me and my kiddos! Sweet Jenna at Speech Room News has yet again put together a great linky that lets you see what’s in everyone’s cart, to make sure you’re not missing out on anything wonderful. Click here to see the whole post. The newest addition to the “Cut & Go” series books–Christmas and Winter! These low-prep books teach spatial concepts, vocabulary, following directions and more! Grab them separately, or in a bundle to save money. Phonological processes are about to get a lot cuter with this winter game you can use until the snow melts. These completely editable newsletters have been such a hit with my parents this year! They keep my parents informed, and my principal impressed. Win-win. I recently saw an article floating around Facebook listing 13 jobs for people who don’t want to work a a lot. And right there smack in the middle was the listing “Speech-language pathologist”. I’ll be the first person to tell you that any time I see my job title pop up anywhere I get excited because “someone knows what I do!” is a fun feeling. I chuckled, and kept scrolling. Some days my job is really easy. Just the other day, my height was used to help decorate the top of my school’s Christmas tree we put in the lobby, and I got to sit with some of my favorite little friends during an assembly put on by the local orchestra. Sometimes Often, you’ll find me in the toy aisle of some of any given store in my town hunting for new therapy materials and ideas. I drink a lot of coffee, and wear silly t-shirts on casual Fridays. I get a winter, spring and Thanksgiving break not to mention summer. Other days, I’m exhausted because it’s IEP season, and I have 12 case conferences in a single day (and those IEPs just don’t write themselves!). More often than I’d like, I walk into school on a Monday to find a child on my caseload has moved away over the weekend and I didn’t get to say goodbye. What’s more, is we had just started to make headway on his severe stutter. Or, I walk into my clinic job after school to find the tiniest baby on my caseload is in the hospital with pneumonia. Again. Other times, my kiddo at school is having another screaming meltdown because he needs something, but can’t express himself enough to tell us what it is. I write a lot of paperwork. A LOT. I take work home in the evenings, and spend many a Sunday afternoon curled up on the couch with my laptop, a blanket and watch football with my people. Even if you’re part of the “I don’t take work home forever and ever amen” tribe (teach me your ways!! 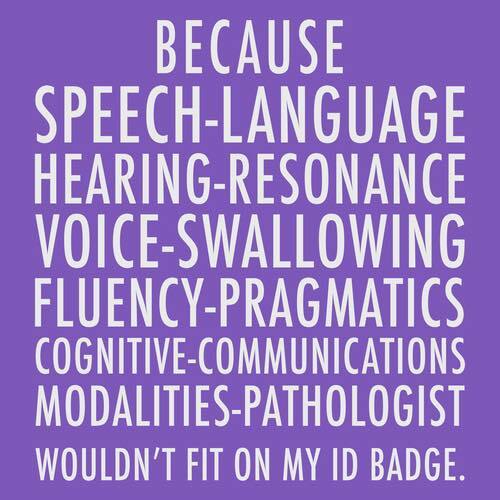 ), I’ve yet to meet an SLP who responds to the question of “Do you have time in your day to XYZ” with “My whole day is wide open!”. I evaluate, plan, treat, problem solve, take data, problem solve again, trouble shoot technology, hold meetings, and attempt to get to the bathroom. I work. So very much. And I wouldn’t trade it for the world. I’m so blessed every day to wake up and help change children’s lives. I cherish every “thank you” from parents, every “we’re so glad you’ve been a part of our lives” card, and every “Ms. Jones, do you see me today? !” from my little loves in the hallway at school. If you ask me, I have the best job in the world. But if you want to tell me it’s the easiest? Come hang out with me for a day. And bring a cup of coffee along with your running shoes. The last time I was at ASHA, I was in grad school still trying to wrap my head around all that is speech therapy (let’s be real, that’s still me most days)….and it wasn’t snowing. NOW in a few hours I’m jumping on a plane to meet up with 14 of my blogging besties….and thousands more of new friends I just don’t know I have yet! YOU! Want to know where you can catch me while I’m in Denver? Make sure you follow all of my Social Media accounts to stay up to date with what’s going down–you don’t want to miss out! 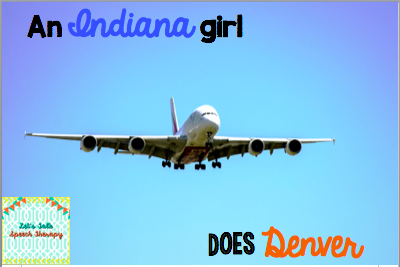 Are you not headed to Denver? 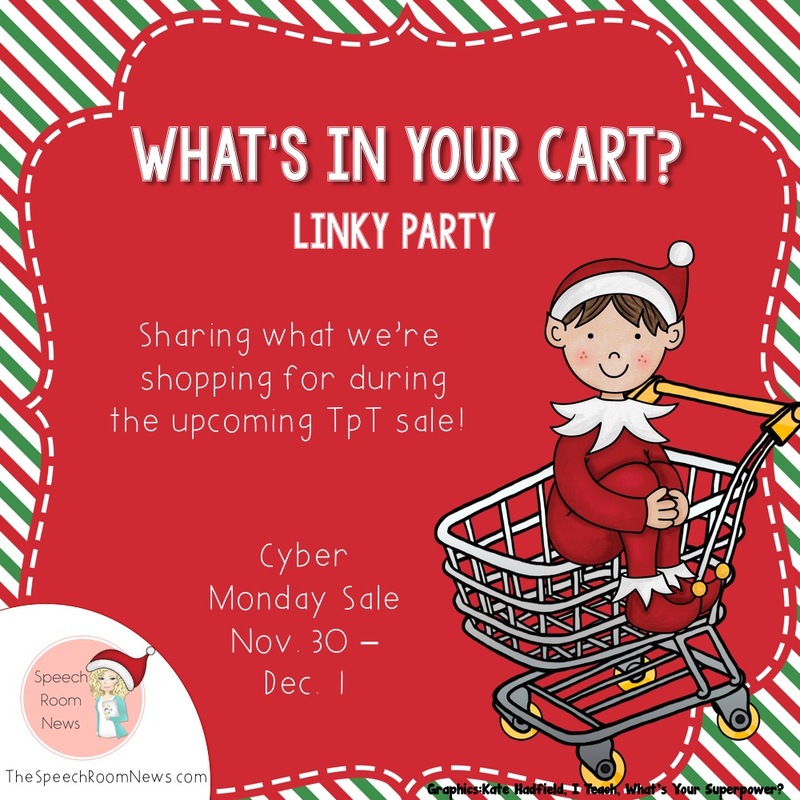 My TPT store will be 20% off Thursday-Saturday so you don’t have to miss out on the goodies! And trust me–I’ll social media enough things that you feel like you’re there….without the cold & snow. Halloween is right around the corner, but in my speech room it’s already Thanksgiving. 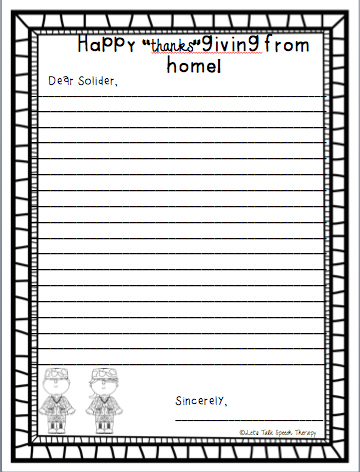 This year, most of my students are writing letters to soldier’s overseas who won’t be home with their family for the holidays. I was on my way to work in the morning when I heard about a program called “The Big Thank you” on the radio. (Click the link to find out more) I thought it was sweet and was about to flip the dial until I thought “Wait! Why am I NOT getting involved? !” By lunchtime I had my plan together and was so excited I e-mailed the rest of my building to see if any other classrooms wanted to participate, too. I expected a cute mini-writing activity, but what I got was much better. Each time I introduced the activity, I could hardly finish my explanation before my students’ hands were in the air. “I’m going to say they’re brave!” “How do you spell encourage?” “My dad is in the military, but he’s home now. Those kids must feel so sad with their dads being far away!” I was completely impressed at how a simple activity had sparked so much language and conversation! My students were not only motivated to write (a less than preferred activity for most of my caseload), but they were perspective-taking, working together for ideas, and eager to jot down their ideas. After our letters were finished, I shared some with classroom teachers and some I sent with students who receive occupational therapy in order to perfect handwriting. 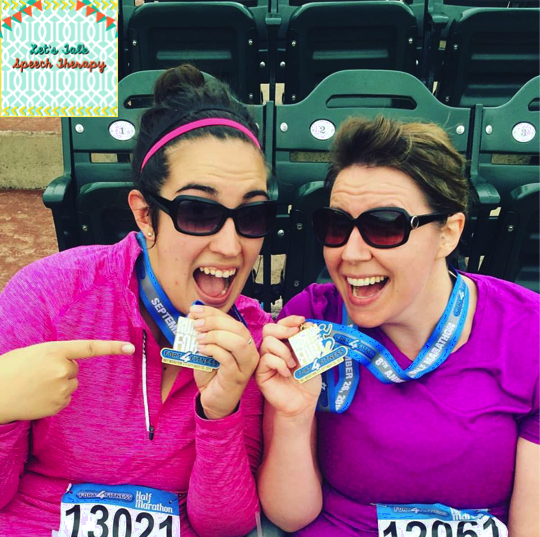 “A” is for Apple–a very speechy apple week! Amazon Affiliate links are provided in this post for your convenience. If you follow me on Instagram or Facebook, you’ve probably figured out by now that fall is one of my favorite times of the year. I could write an entire post on why that is, but for now, just go with it. 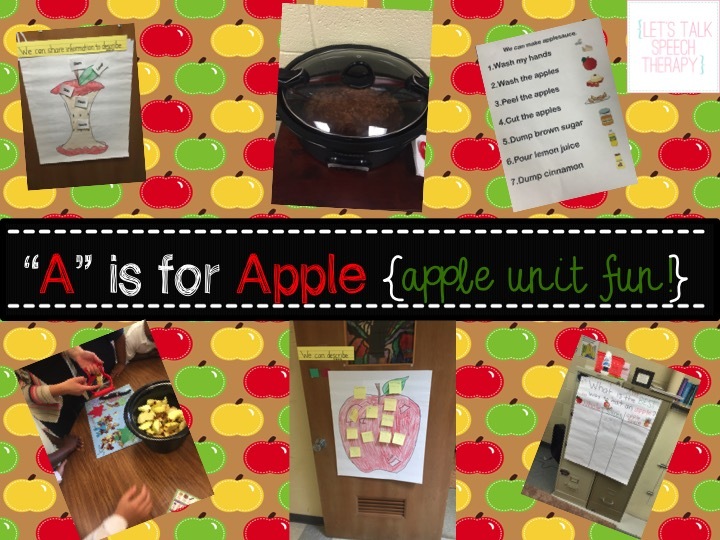 Once the air gets cool, I instantly start craving any and all things apple flavored, which had me geeked for a week full of apple-tivities in my speech room! I used a lot of books this week (let’s be real, I always use a lot of books! ), but a few fan favorites from my kids this week were Apples for Everyone, Apples, Ten Apples Up on Top and Apple Trouble. When we read in my room, students listen for their articulation targets, answer comprehension questions, predict, label vocabulary…you get the idea. 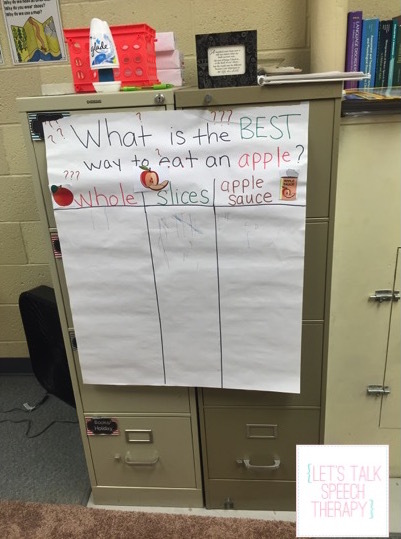 This anchor chart hung on my filing cabinets all week, and each child I see got to vote for their favorite way to eat apples. Not only did this allow great learning times for concepts of voting, sharing your opinion, and the concept of “best”, we also got to talk about most, least, popular, unpopular vocabulary terms. The picture is hard to see, but apple slices won by a landslide! My students know (well) that art is not one of my strong suits, so a couple of these activities required a little help from my building’s amazing art teacher. 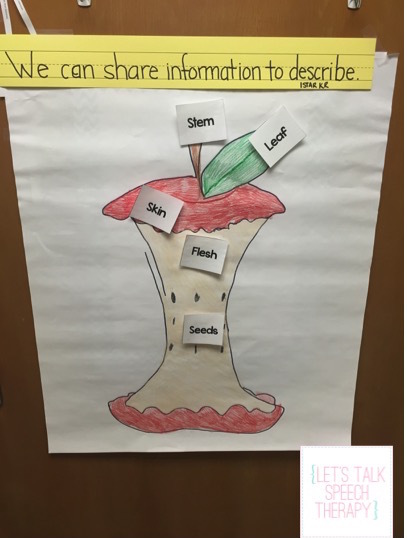 She drew up this apple core for me–I colored it, added some velcro, and printed/laminated vocabulary words and voila! My low language students loved attempting to read the vocabulary words and place them on the correct velcro spot on the apple. The cards were a great size for my loves with fine motor challenges! This anchor chart activity takes apple labeling to another level. I brought in a few real apples from the grocery store and placed them on our small group table. Only one got accidentally bit into :-). 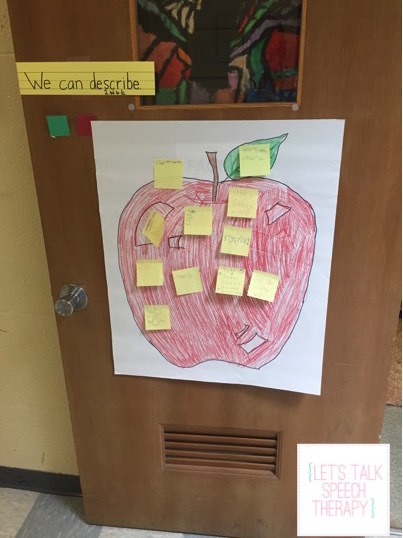 Then, everyone got a colored pen and a sticky note and wrote down all the describing words they could come up with to describe the apples on the table. They loved getting their hands on the actual apples, and any time we get out colored pens is a good time. I loved hearing students point out their sticky note to their classmates as they walked down the hall. Thursday was SUCH a fun day! I worked with my building’s incredible occupational therapist and went into all three of my building’s functional skills (mod. 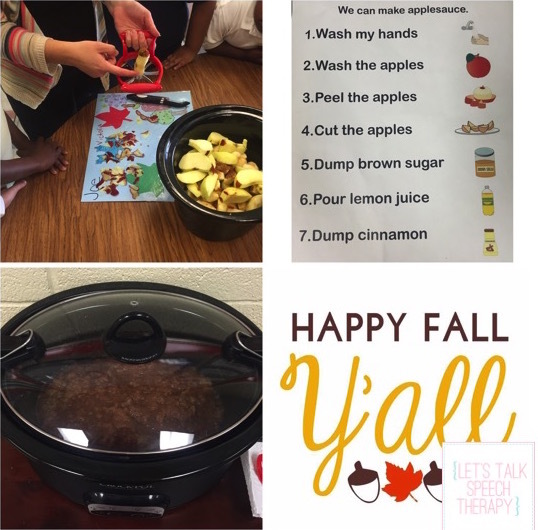 cognitive) classrooms to make a big, warm batch of applesauce! My Smarty Symbols subscription was a life saver in throwing together these directions for each group the morning of the activity. We prepped the applesauce in the morning and it was ready to go by snack time in the afternoon! My teachers and principals loved this activity, and the rest of the staff was happy with how good most of the building smelled all day! I used this recipe I found on Pinterest, and it was really tasty. My little language learners were nuts over these Cut & Go Fall Basic Concepts Books. With everything else I had to prep for the week, only needing scissors, glue and little prep time made me love them, too 🙂 . They took an entire session for some of my students, and were easy to send into the classroom/home for homework for additional carry-over. You can download them in my TPT store here! Whew! Just re-capping my week makes me need a nap! It was a full, fun week but these are the kinds of weeks that remind me that my job is a whole lot of fun and not “work” at all. 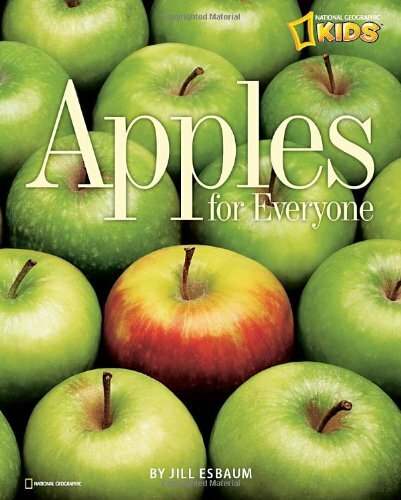 Do you do an apple week in your speech room? 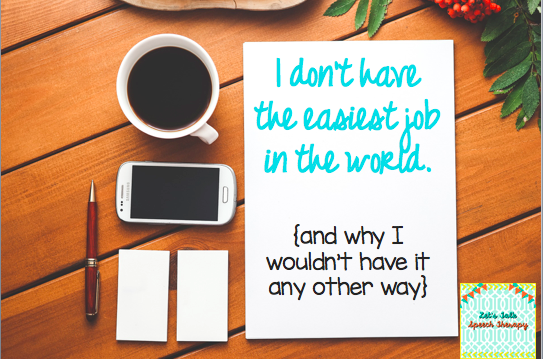 I’d love to hear about what YOU do in the comments! One of my (many) personal goals this year is to find ways to improve parent communication with those families on my caseload. I spent most of my summer working in a clinic and was quickly reminded how vital parent involvement is in treatment! This is my second consecutive school year in the same building, a first for me, and I’m tucking my tail between my legs when I tell you that last year the only time I saw some parents were at our annual case conference. Yikes. 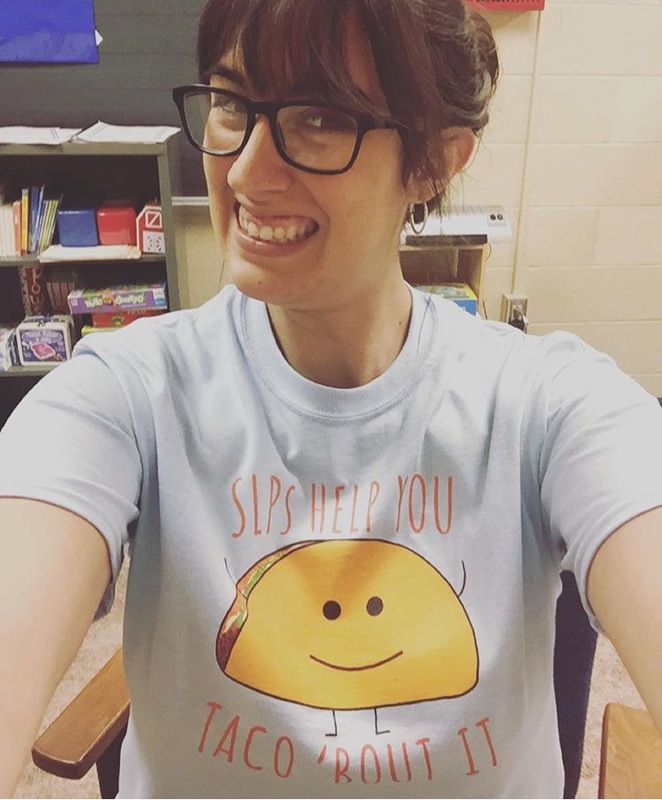 We’re just over a month into the school year, and using some of these tips have already greatly improved my parent communication, which means better progress for my kiddos. What’s not to love?! At the end of the year last year, our Principal started using a program called “Remind” and I instantly jumped on board! The only requirements? The ability to send (and if you’re a parent, recieve) a text message. Remind is a free program that allows educators to safely text members/families in their classroom. Your number isn’t shared, and recipients of the text can’t reply, but I use this service often to text reminders to parents about homework and case conferences. You can download the free app or send messages from the website–all families need is your unique class code and password to sign up! Click here to visit Remind. I took a hint from our Functional Skills students and have started communication journaling with a few of my students, especially my low/non-verbal students. All I do is stick a notebook,or a folder with paper in it labeled “Speech” and keep it in my student’s book bag. I write notes as needed, or any questions I may have (family names if we’re working on “who” questions or other specifics about a student) and parents write back. Or, since my Functional Skills students already have communication notebooks sent home by their teacher, I’ll jot something in the teacher’s entry for the day when I drop the student off after our session. Almost every one of my favorite TPT sellers have homework packets–some seasonal, and some for the entire school year. I’ve been totally blown away at the amount of parents who will jot notes on homework sheets like “This was hard” (a certain sound, position or language task), “Sorry this is late” or comments about how great their student did. Some of my favorite homework packets are from Crazy Speech World and Busy Bee Speech. My newsletters have been another big hit in my building this year! The first week of each month I send them out via e-mail. My students take some so. much. paper. (see #3!) that often things get overlooked. I work in a highest-poverty elementary, but a good majority of our families have access to e-mail on their phones or can check it at a local library. One of the PTA members at my school reminds me how much she loves these one-page documents almost every time she sees me! Like using Remind, technology is my friend when it comes to avoiding the black hole that is some of my student’s backpacks. We’ll work on that executive functioning later. Click here to check out my Editable Newsletters. Our days are long and I’m the first one to tell you my paperwork stack is huge. But one of the easiest ways I’ve found to connect with parents is to get involved at my school! Volunteering at school carnival, helping at dismissal/arrival, being present at Back to School night, etc. is a great way to simply show your face. More times than not, at least one of my students will run up to say “hi” at an event like this, or at least wave from across the room, and their parents want to know who they’re so excited to see. While I usually don’t talk about about sensitive information in these “public” settings, it helps for both the parent and I to put a face with a name and continue to build a relationship. What ways have you found parent communication to be easiest? I’d love to hear your ideas in the comments! Hi, it’s me, your child’s speech therapist. I’ve seen a lot of moving posts floating around the Internet from parents to teachers/therapists, so I thought it was time I write one to you. Maybe you sit across the table from me at a case conference. Maybe you wait patiently in the waiting room every week. Maybe yet you open your home to me or meet me at the library for early intervention. Sometimes your hair is in place and your child comes to me clean and freshly pressed, and other times your make-up is a day old and your sweetie hasn’t made it out of his pajamas before lunch. You cringe when I ask to use your bathroom because you’re not sure the last time you scooped laundry up off the floor. Whatever the case, I notice you. I spend a few hours a week with your child, but they are yours for the rest of the time. You run from therapy to the grocery to soccer practice in between practicing speech sounds in the car, feeding tube schedules or naming objects as you dash through the grocery store to help grow your tot’s vocabulary. You juggle finicky diets, weighted vests and favorite toys with ease. How I wish I could be like you! Sometimes you have it all together and sometimes you’re not sure where “it all” is. You fall into bed exhausted and wake up early to start it all over again with better endurance than an Olympic athlete. You warrior through each long day and longer night and sometimes feel unnoticed. Let me be the first to say you inspire me. Oh, how I need you! I can write goals, take data, and gather materials until I’m blue in the face but without you, it’s pointless. You are the expert on your child. You know your non-verbal child’s angry cry versus their tired cry, and you know well before we’ve hit the overstimulated mark. Even if I’ve been with your child for some time now, no one knows your sweetheart like you do…even when you think you don’t. You are the one who knows how to best motivate your child to be their best,and you are the link to what I do during therapy and the way it makes a difference at home and in the classroom. You and I make a really great team, and to be honest, there’s no way I can make the difference I want to make without you. You’re so valuable to what I do. …I am on your side. This is far from just a job. This is my passion. Those goals, data, and materials I mentioned? I went to school for a (really) long time to get where I am today. I spend so much time that you don’t see reading, talking with other speech therapists, learning, asking bigger questions, and cutting out “those” picture cards all for your child. I don’t tell you that to impress you or make you feel bad, but so you know I’m committed to what I do. I love what I do and, even on meltdown days, I love your child. Knowing that I get to do what I do every day is what gets me out of bed. I’m in this for the long-haul, and I promise to keep reading, planning, and researching for your child. And, of course, for you. *a special thanks to the special needs parents in my life who inspired this post. 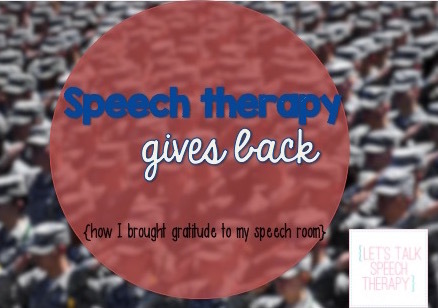 Let's Talk Speech Therapy shared a video. 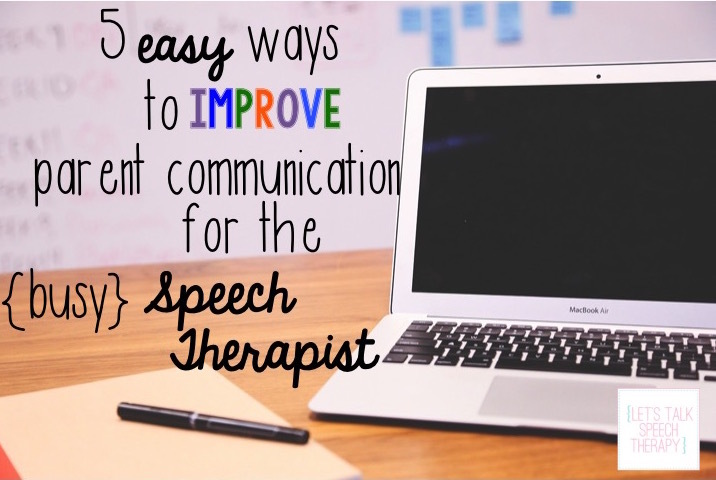 Let's Talk Speech Therapy shared a post. - All "Upgrade to Pro" options in the free apps will be on sale too! My course had a small title change...just know we’re going to talk all things huge caseloads (mine usually hangs out in the mid-high 90s 😳) and how to not lose your mind. I’m gonna give away stuff and my dogs will more than likely make an uninvited cameo 🐶... it’s gonna be so.fun. Such an important AAC skill to remember (and even sweeter story💕)!The dental hygienist opened a drawer and commented that she had bubble gum or strawberry flavored toothpaste. Many kids would have shouted out their preference. Nathaniel experiences a lot of stress in medical situations like this; he was barely hanging on to his bravery. He was focused on tolerating the eye protection and paper bib. He wasn't reaching for his device to respond. She turned to me and said, "Which do you think he would want?" Picking the toothpaste flavor at a dental appointment offers a small opportunity to control your own medical care. It offers an opportunity to be heard. Having control and feeling heard increases cooperation. But fear was visually bubbling to the surface. Moving on quickly was likely the best way to ease Nathaniel's tension. It was the wrong time to hand him his talker with a trite "use your words" command. Remembering the flavors she had offered, the motor plans to find each word, and actually make a choice was likely too much. I responded, simultaneously instructing the hygienist, simplifying the communication challenge, and prompting Nathaniel. "Hold up one in each hand and tell him the flavors. He can point." Nathaniel had his best ever dental check up yesterday. We've been working hard on healing his medical fears and the trauma medical experiences have produced in the past. Our tool is communication before, during, and after the experiences. We cannot complicate healing by making that communication a test in device use. Augmented Alternative Communication is not only device use. It is simply communication. In all forms. Its goal is connection.